Over the last few weeks I’ve been seeing a surge in the use of the word serendipity mostly used during instances to describe location based services and actions based on them. Yesterday during Facebook’s Places announcement they used the word several times. I’ve been a big fan of the word myself and have used it to some extent but I believe it’s now on the verge of reaching mass exploitation much the same way curation has this year. I stated this in a tweet last night as I was watching the Facebook announcement. 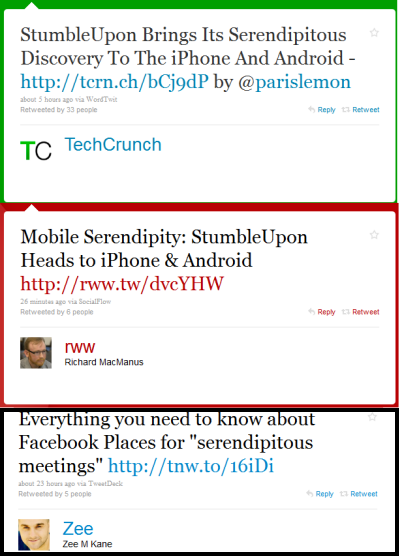 Low and behold, less than 24 hours after that tweet I have seen headlines from TechCrunch, ReadWriteWeb, and The Next Web using it. As attractive as the word serendipity is I’m hoping that it doesn’t suffer the fate of curation, having been so overused this year that I now dislike using it and question its context when I read others using it. As a PSA I provide the somewhat lacking synonyms as provided by Thesaurus.com in a plea for people to not relegate the word into oblivion as curation’s fate has surely been sealed.